I have set up WooCommerce to display categories on the Shop Page (WooCommerce > Settings >Products > Display > Shop Page Display > Show categories and sub categories). This setting seems to be ignored by Themler, it displayes products. Using the theme Storefron, the categories are displayed. Please select Products grid an then enable the Categories. Hi, Please select Products grid an then enable the Categories. !111.png! Thank you! Hi, I have tried this and it is still not showing up. Please make sure that subcategories are set to be displayed in wooCommerce settings as well. 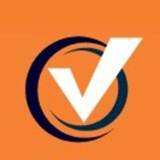 If the issue persists, please create a new private topic and provide temporary access to your website for investigation. I have the same problem. Have enabled categories but get categories and products showing? If the messages above do not help, please create the private topic with the access to the site back end. since last update of theme woocommerce sub categories are no longer displayed. in the theme all the settings for displaying sub categories are on..
Actually everything was OK before the last woocommerce update, I can confirm that the theme was displaying categories and subcategories and by changing theme everything works as intended. Te problem is because something was changed in the last version of woocommerce. PS the link you have posted goes right NOWHERE! Actually everything was OK before the last woocommerce update, I can confirm that the theme was displaying categories and subcategories and by changing theme everything works as intended. Te problem is because something was changed in the last version of woocommerce. PS the link you have posted goes right NOWHERE! Could you please create a private topic with the details to access your site back end. As for the link provided above, you cannot access it now as that topic was moved to private. I have same problem , any news about this? Does the issue persist after updating to the latest version, saving and clicking Refresh or F5? I have same problem. Do you have any solution? In WP admin >> Woocommerce Settings >> Catalog set "Show both" for Shop Page Display and Default Category Display. Enable showing categories and subcategories on Products template: Products tab >> Categories >> Show Categories, then Category >> Show Category, Subcategories >> Show Subcategories. The grid for subcategories will appear. 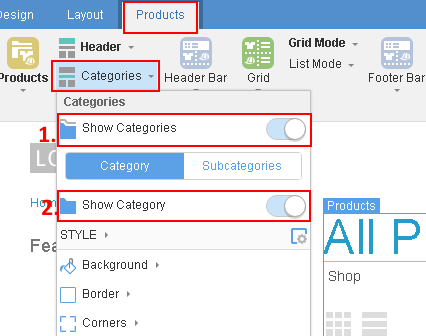 Adjust number of columns in Products tab >> Categories >> Subcategories >> Layout. Add subcategory controls to the grid from Products tab >> Categories >> Subcategories >> Add Control, like Category Name, Category Image etc. I performed your recommendations, but the grid with subcategories did not appear. Can you help me in any way? > Hello, > > Please follow these steps to show subcategories: > > 1. In WP admin >> Woocommerce Settings >> Catalog set "Show both" for Shop Page Display and Default Category Display. > 2. Refresh Content in Themler. > 3. Enable showing categories and subcategories on Products template: Products tab >> Categories >> Show Categories, then Category >> Show Category, Subcategories >> Show Subcategories. > 4. The grid for subcategories will appear. 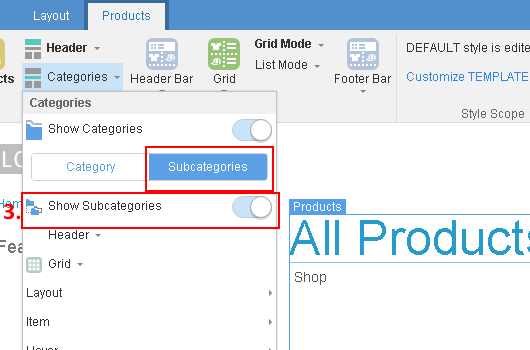 Adjust number of columns in Products tab >> Categories >> Subcategories >> Layout. > 5. Add subcategory controls to the grid from Products tab >> Categories >> Subcategories >> Add Control, like Category Name, Category Image etc. > > Sincerely, > Nettie Hello. I performed your recommendations, but the grid with subcategories did not appear. Can you help me in any way? The grid will be empty until you add some subcategory control like Category Name in there. If there are still difficulties with this, please create a new private topic and provide temporary access to your website for investigation.